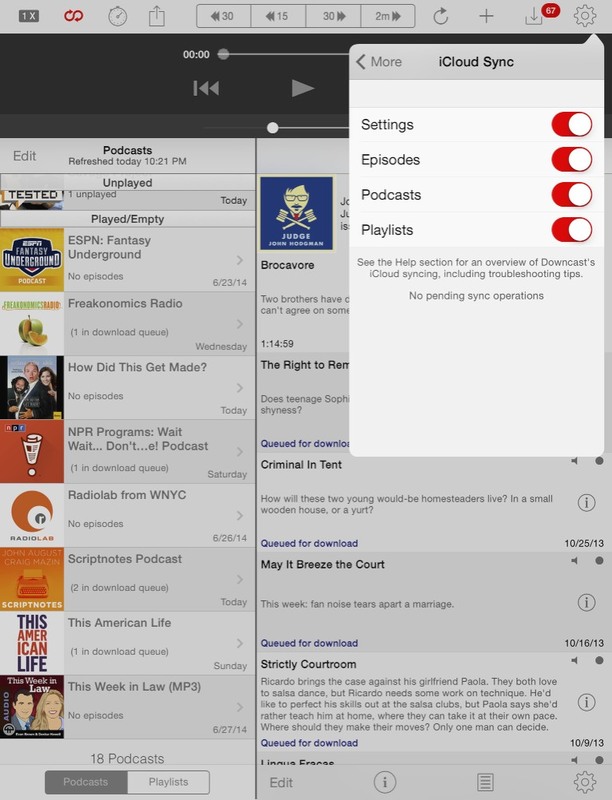 These are screenshots of player windows for both Pocket Casts and Downcast. The same exact info & features are present in both apps, just presented differently. Pocket Casts hides almost everything behind icons. Downcasts lays it all out there. 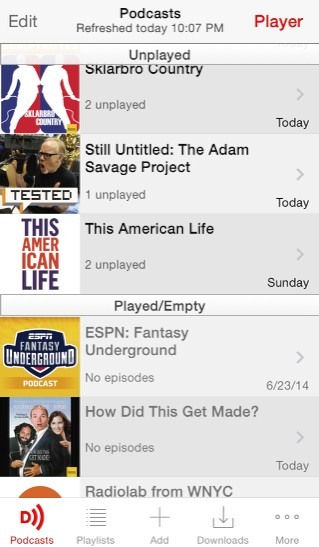 Finding podcasts to subscribe to is much more visual on Pocket Casts. 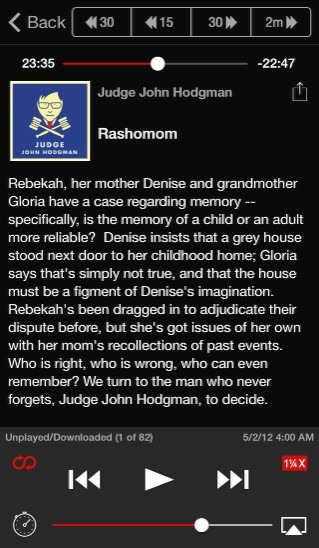 On Downcast, the same functionality is there, but it’s all text-based. 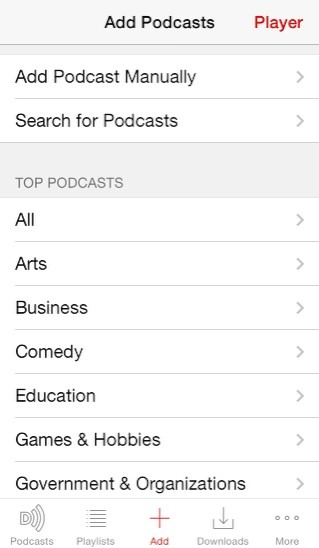 Podcast also has the nifty ability to search via “Podcast Network,” although many notable networks are still missing. Pocket Cast might be winning the interface comparison (if simplicity and elegance are your things), but Downcast’s bread-and-butter is ultimate customizability, and the app does not disappoint. Check out how much longer Downcast’s settings window is. Downcast is feature-rich, but a bit unwieldy. Pocket Cast is much more visual and much more stream-lined. Where Pocket Cast feels clean and modern, Downcast feels dated and cumbersome. I’ve made the switch to Downcast, but only because I spent so much time setting it up, I’m somewhat vested in it. I suspect within a few months, I’ll move onto something else — either back to Pocket Cast if they ever address their filter/playlist duality, back to Apple’s Podcast app if they ever make their playlists smarter, or onto a new app entirely. If Downcast wants to keep me using it — and recommending it to others — they’ll need to overhaul the user interface considerably. In the meantime, I can only recommend it to veteran podcast listeners looking for function over form. This is what Downcast looks like on an iPad. The extra space helps ease the congestion of the iPhone app… a bit. Note the iCould Sync pop-up window. Both apps allow you to sync data between different devices. Downcast uses iCloud. Pocket Cast requires you to register a separate email address & password with them. This is what a playlist looks like. Want to mark an episode as played? Click in the “i” then click on yet another icon then click the phrase “mark as played.” That’s two steps too many. I should be able to mark an episode as played right from this screen, either via pop-up menu or swipe. Want to customize your playlist? Downcast offers every option imaginable. I prefer to be downcast. COME ON Eric! 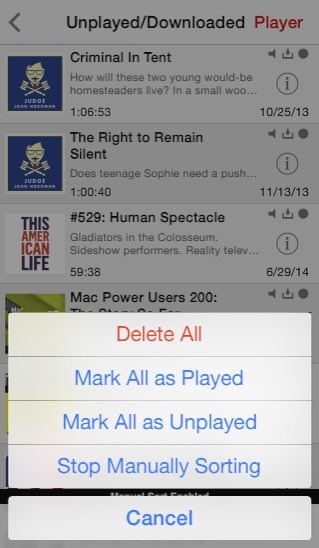 Stop saying Pocket Casts doesn’t offer continuous playback in filters when it DOES. Hold the play button until “play all from here” pops up and tap that. That IS continuous playback so don’t say it lacks it when it has it. I saw your response to my comment about that on your original review and you do have a good point. You should email the developer (shift jelly) about your suggestion/problem with it because I agree that the continuous playback shouldn’t stop if you manually choose another podcast to listen to. I’ve emailed them a few times with about 20 ideas and 10 bugs and they responded point by point asking for more details, describing why an idea cant be done, clarifying if an idea I have is actually already in place but I didn’t know how to do it, or if they love an idea and will have the developers discuss it. They are very receptive and thankful for feedback which is awesome. If you haven’t seen it, Overcast was released recently for free (with $5 in app upgrade) and it’s better than I expected. 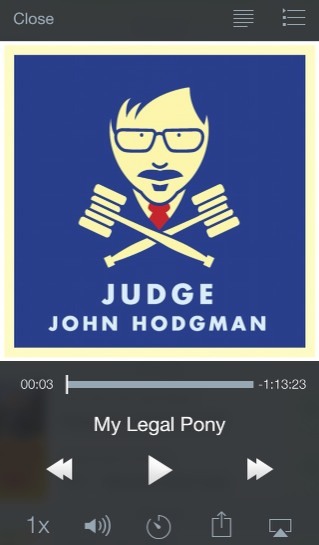 It’s basic but it beats apple’s podcast app right out of the gate which is impressive. It looks nice and has a few cool features that I had actually requested from Shift Jelly. But ultimately overcast has a lot of important features missing and those cool features it does have don’t trump Pocket Cast. I wouldn’t be surprised if most of those features are added to PC in the next big update. Instacast just released an update and dropped their app price to $1.99. I almost bought Instacast before I found Pocket Cast but their big update was apparently super buggy and they force you to pay again for their big updates (unlike all the other podcast apps). Their update apparently fixed all their issues and $2 is fine for me to test it out (it was $4 or $5 before). 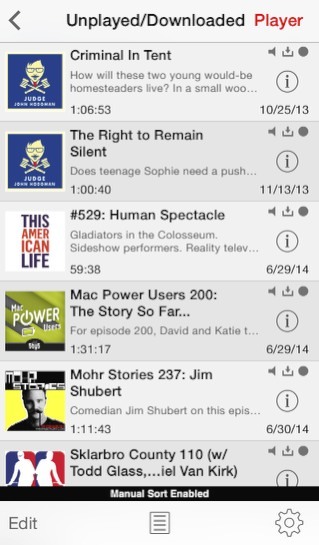 Downcast gets tons of good press but I’m not impressed with the expanded settings menu. And it’s pretty ugly haha. I guess we just define “continuous playback” differently. 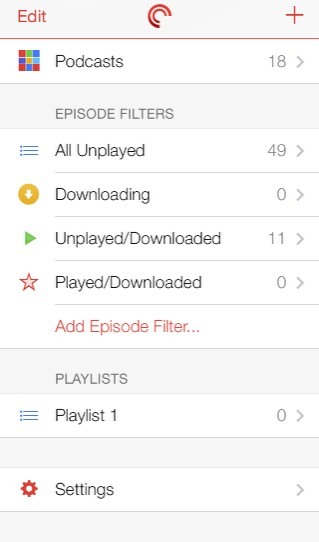 I took a look at the comments that Pocket Casts had been getting at the iTunes store, and a lot of people are annoyed by the separate “filters/playlists” thing, so I do feel like I need to mention it — especially if that’s the main reason I’m still searching for my “ideal” podcast player. To me, a playlist offers “continuous playback” if it will automatically play down the list without me having to anything special. Sadly, the app’s filters simply don’t do that. It has a queue that can be helpful — I really do like the PLAY NEXT feature — but the queue’s habit of disappearing whenever you manually play a podcast episode is frustrating. As for Downcast, I’m using it now. And someone I know just recommended Overcast, too, so I think I’ll try that next. Downcast feels like an app that never got the iOS 7 update whenever every app in the iTunes store did. It could use a bit of an interface overhaul, for sure. 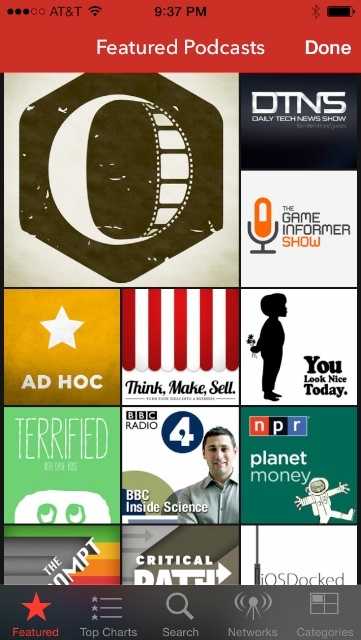 Ok I just downloaded Instacast. Don’t bother getting it. I’m getting a refund I dislike it so much. This app is a mess. It has a couple features Pocket Cast could use but this thing does not have a UX that flows well at all. Searching and Subscribing are also really slow. Thanks for the tip. I’ll definitely be trying out Overcast.